Washington, D.C. — Tonight, U.S. 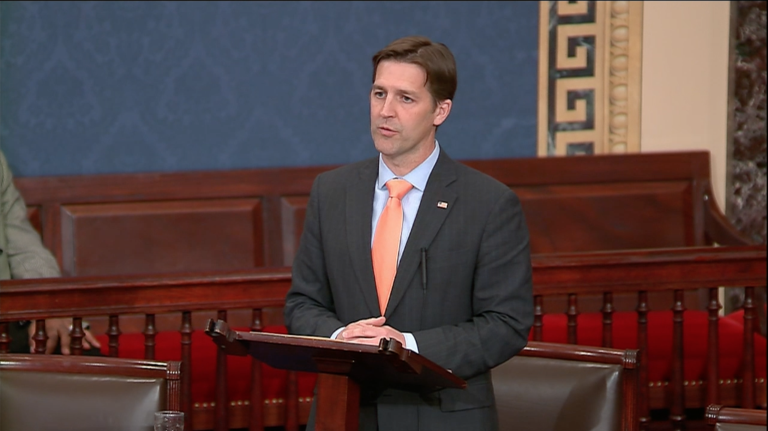 Senator Ben Sasse (R-NE) asked for unanimous consent to pass the legislation banning infanticide, the Born-Alive Abortion Survivors Protection Act. Democrats blocked the request. Sasse's efforts follow Virginia Governor Ralph Northam's defense of infanticide and New York's recent repeal of state-level protections for abortion survivors. Mr. President, thank you. In a few minutes, the United States Senate is going to have an opportunity to condemn infanticide. 100 United States Senators are going to have an opportunity to unanimously say the most basic thing imaginable: and that is that it’s wrong to kill a little newborn baby. Every Senator will have the opportunity to stand for human dignity – to stand for the belief that, in this country, all of us are created equal. Because if that equality means anything, surely it means that infanticide is wrong. Frankly, this shouldn’t be hard. Politicians come to this floor every single day and talk about how they care for the poorest, or the weakest, or the most marginalized members of our society. In recent weeks I’ve heard it stated this way in powerful, eloquent, and from some ambitious Senators, very clear terms about human dignity. But, sadly, in the last week, these beautiful and inspiring words have been choked out by ugliness and the cruelty from another public official. In Virginia, disgraced Governor Ralph Northam, tarnished the American idea of equality under law, he betrayed the universal truth of human dignity, and he turned the stomachs of civilized people not just in this country but in every country on earth. Here's what he said, “The infant would be kept comfortable. The infant would be resuscitated, if that’s what the mother and the family desired. And then a discussion would ensue between the physicians and the mother.” This was the quote. That the infant would be resuscitated if that's what the mom and the doctors wanted to do and then they could have a debate about what to do next. He was literally talking about allowing space and time for a discussion about infanticide. No euphemisms. No weasel-words. Infants could kept comfortable and resuscitated. And also, baby girls left cold and alone to die. Just a few years ago the abortion lobby was really clear in its talk in hoping that abortion would be ‘safe, and legal, but rare.' This was the slogan. Abortion would be 'safe, legal, and rare,' Now we’re talking about keeping the baby comfortable while the doctor have a debate about infanticide. That is what we’re talking about here on the floor tonight. We’re not talking about second trimester abortion, we're not having some big complicated discussion about a mothers reproductive freedom, as important as all those debates are. We’re actually talking about babies that have been born. The only debate on the floor tonight is about infanticide. The abortion industry’s PR army couldn’t defend this. Many in the national media decided to try to overlooked it. But none of us in this body can escape it. What we’re talking about on the Senate floor tonight is infanticide. And instead of saying he misspoke, instead of offering an apology, the governor of Virginia decided to doubled down on ugliness and cruelty. This isn’t about clumps of cells. This is fourth trimester abortion. That’s actually what we’re talking about here tonight. Governor Northam is a disgraced coward and he has such an abysmally view of human dignity that he couldn’t bring himself to say this basic truth: it’s wrong to let little babies who've been born die. This isn’t about Republicans or Democrats. We're way beyond that Everyone in the Senate ought to be able to say unequivocally that the little baby deserves life. That she has rights, and that killing her is wrong. Tonight, every member of this body has that chance. The Born-Alive Abortion Survivors Protection Act prohibits exactly the kind of infanticide that Governor Northam was endorsing. That’s it. That’s what the legislation is about. It’s based on the simple idea that every baby deserves a fighting chance. Its a simple idea that every human being is an image bearer, even the weakest and the most marginalized among us are no less human, and every one of us has a moral obligation to defend the defenseless. It’s my understanding that some of my Democratic colleagues are prepared to object tonight and I humbly say that I don’t understand why. I beg you from the bottom of my heart not to do so. Please don’t betray the ideals that have been so eloquently expressed. Please don’t reduce truths to and empty campaign slogan. Please don’t take the principle of dignity and equality this cheaply. There are just two sides of the debate on the floor tonight: you’re either for babies or you’re defending infanticide. That is actually what the legislation is that’s before us. Please do not block this legislation. Please don’t let Governor Northam define you. Don’t let an extremist pro-abortion lobby and pledge hold you hostage. Please don’t leave innocent babies to die. Please don’t protect infanticide. So Mr. President I ask unanimous consent that the committee on the Judiciary would be discharged from further consideration of S. 130 and that the Senate would proceed to the immediate consideration of that. I ask unanimous consent that the bill be considered third for a third time and passed and that the motion to re-consider be considered made and laid upon the table.